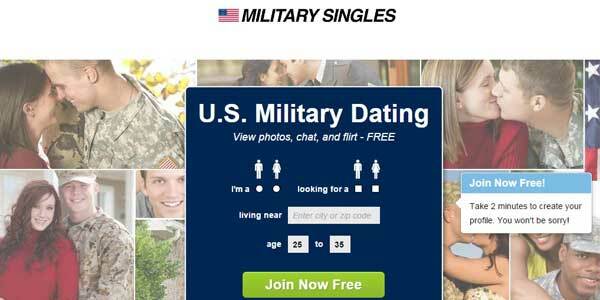 MilitarySingles.com is the largest online dating community for members of the US military. But it's not only restricted to the military. Anyone who wants to date a military single is welcome to join and try to find their match. 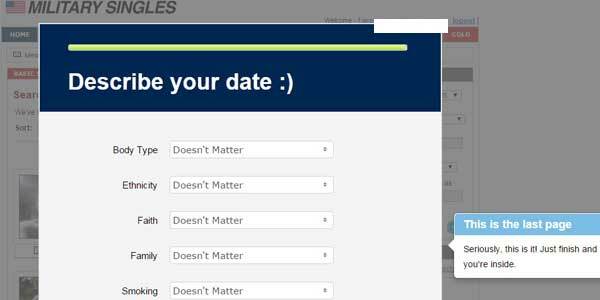 The site's goal is to make it easier for service members who are training or on an active tour of duty to find both casual dates and serious relationships. Military Singles incorporates a lot of features into its website in order to give members an optimal chance at finding love. By answering questions about yourself, it calculates your personality in an effort to provide you better matches. It also features a basic search function, as well as the ability to send messages and chats to people who draw your interest. One particularly unique feature is the military dating advice the site offers, such as how to send a care package overseas or how to cope with a long distance relationship. You can sign up right from the home page. Simply enter your gender as well as the gender you are looking to date, your location, and a suitable age range. You will then have to enter your birthday, username, email, and password. Continue by uploading a photo of yourself, describing your appearance, noting interesting details about yourself, and entering your service details. Next, you get to the good part, where you get to describe your ideal date! Finally, your profile will be created, and you will be immediately directed to a search results page. MilitarySingles.com is a relatively safe dating site. Your real name, email, and birth date are never revealed to anyone, meaning it would be very hard for someone to find out your true identity. Additionally, the site has a Safety Points page that gives advice on how to protect yourself when meeting someone in person. Users can also report photos and profiles that seem fake or obscene, creating an atmosphere that is safe and honest. While you can use most of the site without subscribing, certain key features are off limits, such as the ability to read emails. Additionally, paid members have a higher ranking in the search and no ads on the site. You can choose to pay via PayPal or credit card and have several plans to choose from. A one year plan costs $10 a month and is billed as a payment of $119.95. A six month plan will cost you $14.99 a month and is billed as a payment of $89.95. If you prefer a short term commitment you have two options: a three month plan costs $19.98 monthly and is billed as a payment of $59.9 or a one month plan at $29.95 a month. The design of Military Singles is rather straightforward, helping you adjust easily to its interface. Across the top is a menu bar with links to all the different pages on the site. Below that is a counter that displays your number of messages, users currently online, number of profile views, and the number of people who have favorited you. The home page also shows you how complete your profile is, your site activity, featured members for you to browse, and a small search interface. While it's basic, it should be everything you need to connect with others. The search function on MilitarySingles.com is very easy to use. Simply click the Search button from the top menu, and you will immediately be brought to a listing of results that meet the criteria you listed in your profile. To narrow it down even further, you can search for a range of ages, distance from yourself, keyword, member status, and whether or not the user has a photo. You can then sort by most recent activity, location, or popularity. Finally, you can view your results in profile view, gallery view, or list view. Once you find a search combination that works for you, you can save that search for later so you don't have to waste time changing all the settings. 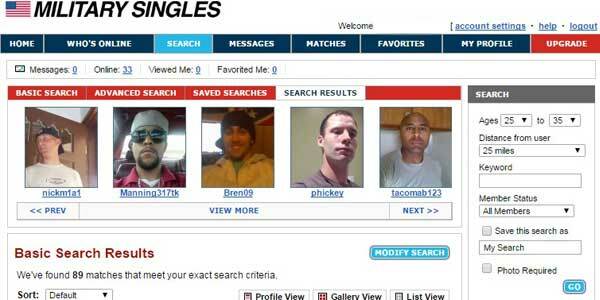 MilitarySingles.com takes a unique angle on the online dating trend by catering exclusively to the military audience, which makes it the perfect choice for service men and women. However, if our Military Singles review still hasn't convinced that this is the site for your military singles dating needs, why not try EliteSingles.com, a site motivated professional adults. While the website layout and design are a bit dated and in need of refreshment, the fact that all members of the site have a military mindset overcome any weaknesses. Additionally, there are a lot of features you can access without paying a subscription - making it a good opportunity for someone who might not be ready to take the plunge into paid dating.